This is an ode to my mother. Actually, it’s an ode to the green-bean casserole, that quirky vintage dish that I grew up with — along with many people in this fine country. The basic ingredients include Del Monte green beans, a can of Campbell’s condensed cream of mushroom soup, and fried onions on top. My dad worked for Campbell's when I was growing up, so we got all the free soup we could eat, so I assumed my mom’s amazing recipe for this comforting Thanksgiving casserole was a Begley family special. Alas, it turned out that we were not alone in our love of this dish, originally created in 1955 by a member of the home economics department at Campbell’s. 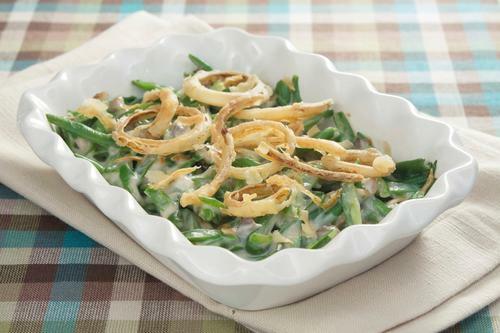 According to Del Monte, 30 million green-bean casseroles will appear on tables across the country this Thanksgiving.